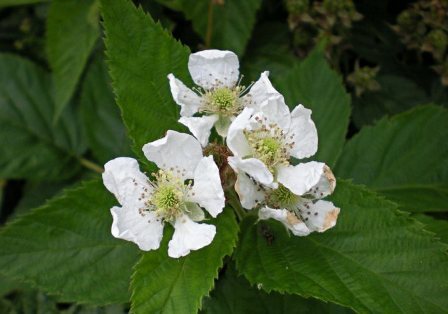 North American blackberry grows wild in Canada and the Eastern United States. It is found mostly dry prairies, woodland margins, roadsides and stream margins. 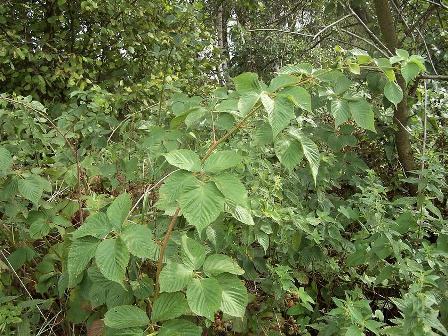 A sprawling shrub, 2 m high, with arching canes that form dense thickets, often well over head-high, particularly when supported; canes stout, strongly angled with large hooked prickles, dull reddish brown, lacking glaucous bloom; cane tips do not root; bark similar to twig but darkens with age. Leaves alternate, palmately compound, 3 to 5 inches long and wide, 3 to 7 leaflets (mostly 5), ovate to oval leaflets, serrated margins, prickles on petiole, dark green above and much paler below. Inflorescence a terminal raceme with 12-many flowers, lowest flowers are subtended by a leaf, pedicels glandular; calyx 5-lobed, acute, pubescent and glandular; petals 5, white, narrow; pistils many, inserted on hypanthium; stamens numerous. Fruit an aggregate of drupelets, about 2 cm long and 1.2 cm in diameter, oblong, deep-violet, juicy, does not separate from core when picked. The fruits possess a pleasant and somewhat spicy flavour. These taste good. These are eaten raw or used in jams, jellies, and sauce. Young shoots of this plants are also edible. These are harvested in the spring, peeled and used in salads. The roots are reported to be antihaemorrhoidal, antirheumatic, astringent, stimulant and tonic. An infusion can be used in the treatment of stomach complaints, diarrhoea, piles, coughs and colds, tuberculosis and rheumatism. The infusion has also been used by women threatened with a miscarriage. The root can be chewed to treat a coated tongue. An infusion of the root has been used as a wash for sore eyes. The leaves are astringent. An infusion can be used in the treatment of diarrhoea. 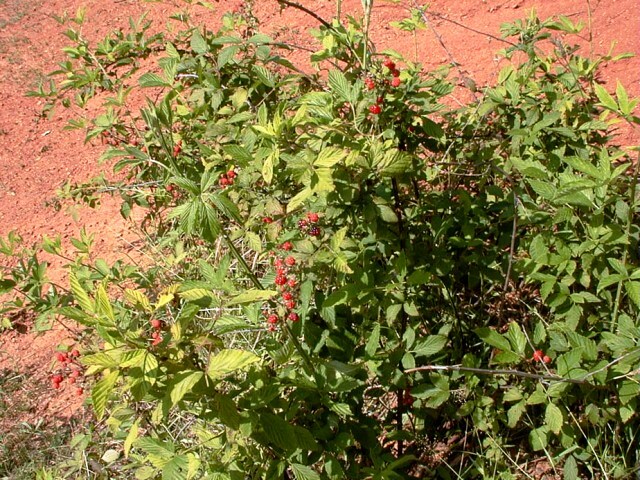 An infusion of the bark has been used in the treatment of urinary problems. A decoction of the stems has been used as a diuretic. A purple to dull blue dye is obtained from the fruit. 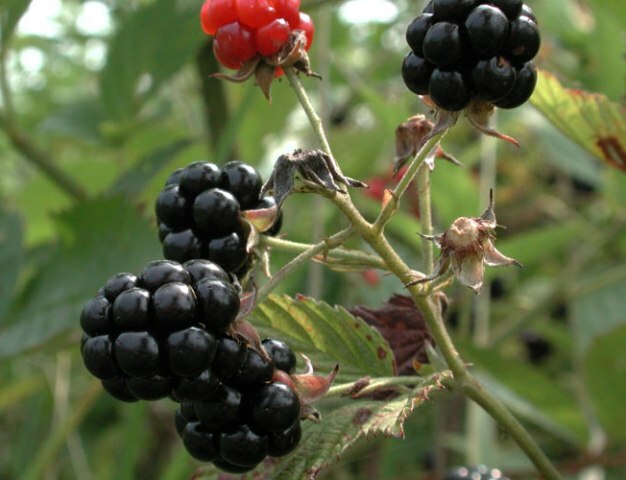 North American blackberry is often cultivated for its edible fruits in America. Even some named varieties are also available at nurseries. It grows easily in a good well-drained loamy soil in sun or semi-shade. Plants have biennial stems, they produce a number of new stems from the perennial rootstock each year, these stems fruit in their second year and then die. Plants in this genus are, however, notably susceptible to honey fungus. Seed – requires stratification and is best sown in early autumn in a cold frame. Stored seed requires one month stratification at about 3°C and is best sown as early as possible in the year. Prick out the seedlings when they are large enough to handle and grow on in a cold frame. Plant them out into their permanent positions in late spring of the following year. Cuttings of half-ripe wood planted in July/August in a frame also root. Tip layering done in July also succeeds.